Sometimes you really want cake but you really don’t need to make a whole cake. It happens to everyone. 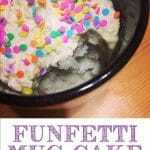 Make a Funfetti Cake In a Mug for a treat for one. Sometimes if I fight a sweet craving I start having dreams about it. I mean it, I have dreamt of dancing doughnuts a la Beauty and the Beast. It was weird, so I’ve learned to find a way to satisfy those cravings without killing my healthy eating. 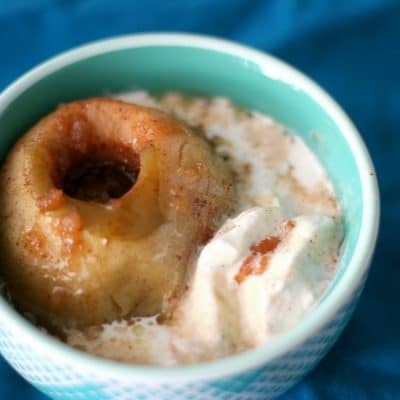 Cake in a mug is a fantastic invention and whoever first thought it up was absolutely brilliant. One night I was up late working and I had been craving cake with buttercream. I love my ridiculously specific cravings. So I whipped this up enjoyed eating it and moved on. The hardest part about making this cake is waiting for the cake to cool at least a little bit before you put the frosting on. I didn’t and you can kind of tell my frosting was melting on the sides. Oops. It still tasted fabulous so if you don’t mind go for it. Mix together cake ingredients in a mug. Microwave for 45-60 seconds depending on your microwave. Check your cake with a toothpick to see if it’s done. While the cake cools, make your frosting. If your butter is cold microwave it for 5 seconds. Whip it really well with a fork. 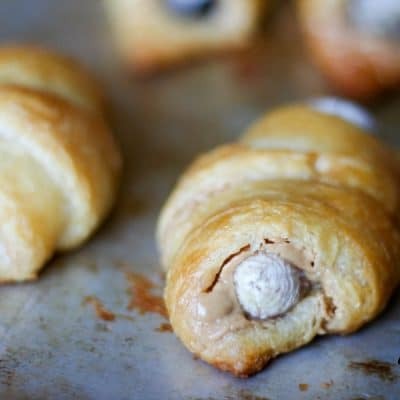 When whipped add powdered sugar and whip until incorporated. Add vanilla, salt, and if needed milk. Mix again. Spoon over cooled (or at least mostly cooled) cake. Sometimes you really want cake but you really don't need to make a whole cake. It happens to everyone. Make a Funfetti Cake In a Mug for a treat for one. Mix together cake ingredients in a mug. Microwave for 45-60 seconds depending on your microwave. Check your cake with a toothpick to see if it's done. This is so much fun. 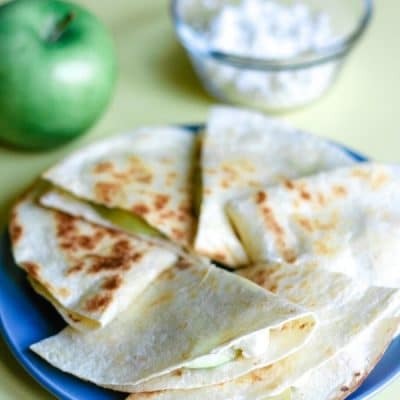 I bet the kids would love tucking into this! Absolutely. I eat it just because it’s there not necessarily because I really want a piece. So this removes that major temptation and I’m pretty sure my waistline is thanking me for it. Stopping in from the Two Uses Tuesday Link Up. This cake looks awesome! And even more reason to keep cake mix in the house. Pinning! I hope your grandkids love it! My kids would love this! 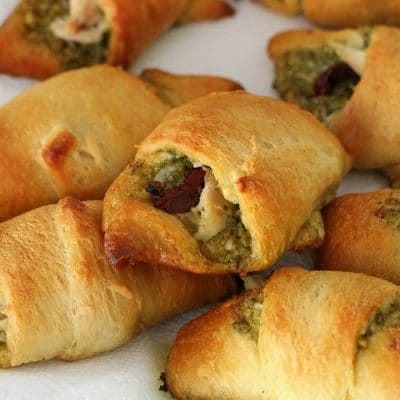 Thanks for sharing on Tasty Tuesdays! This idea is genius. So much of a whole cake gets wasted. Printed & pinned, thanks for sharing at Pin-Worthy Wednesday! We make mug cakes, but I’ve never used premade cake mix…duh….lol. My girls would love this. It totally speeds up the process. Especially when you are lazy and really want some cake. So yum! Thanks for sharing at Snickerdoodle. Love the idea of a serving of one! This looks so yummy!! Thanks for sharing your funfetti cake at The Pin Junkie! It’s being featured at this week’s party! 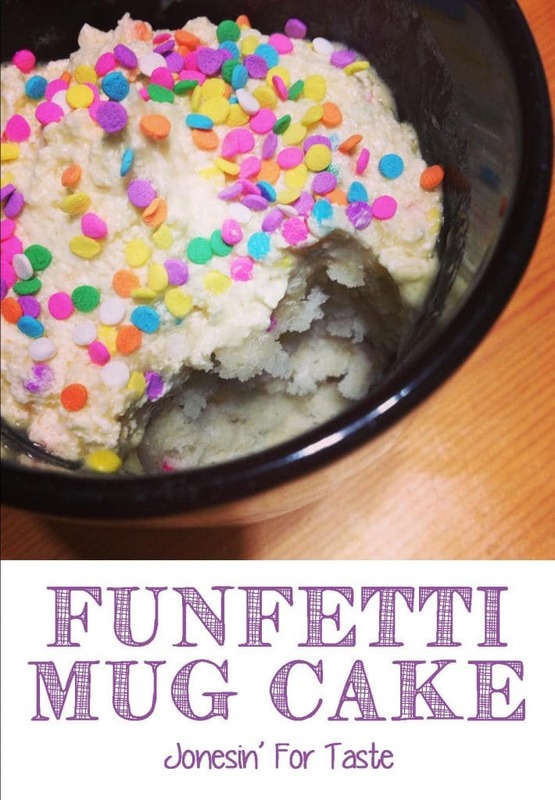 This funfetti cake in a mug looks so fun. I do like the idea of making a mug of cake – as long as I can put my frosting on it! Have a great Labor Day weekend.